Having spent a lot of time in China over the past few years, it’s something I’ve grown accustomed to seeing (and hearing). It no longer has that shock value when I first experienced it in a public place near our China office in Anting, just west of Shanghai. Various explanations for the habit have arisen, the most popular being a desire to expel germs or illness from the body as a result of respiratory illnesses stemming from air pollution. “It would be disgusting to swallow it again, wouldn’t it?”, asks one young Chinese interviewed on the topic recently. Over the past few years the Chinese government has reacted to prevailing international sentiment on this subject, banning spitting in public in some cities, including Hangzhou, the home of “Alibaba” and China’s tech revolution. But as my business partners who live in China will implore, don’t dwell on these little cultural quirks when it comes to developing opinions about China and its people. Here’s a recent piece penned by my colleague Marcella Davie, who’s our full time Operations Manager in China, but also a passionate, part-time observer and lover of everyday Chinese culture. Having lived in China for the past 4 years, I have grown to love this country. While my Chinese friends have a fascination for my home country, with its clean air and healthy lifestyle, there are many things that Australia can learn from China that might seem normal or commonplace here. When I tell my Australian friends and family about what living in China is like, they can’t wait to visit. Don’t get me wrong, I love Australia, and it will always be the country I am drawn to the most. But here are my top 8 reasons why I think China is great and why Australians would love living here, starting with the four “Fs”. There is something very special about Chinese families. In Australia, once children have finished school, they often leave home to start work or go to university. Grandparents generally only come over at birthdays and Christmas, the “empty nest” is normally considered a time of relief and achievement. But in China, seeing three and sometimes four generations of families spending time together, sharing meals, childcare and housework, is a testament to selfless nature of the Chinese. Stronger family values and close relationships are something we can learn a lot from in Australia (I think we slowly are). It’s a bit of a cliché but most travelers will say of any new culture they experience, that they are so very friendly. But I’m not a tourist and after living here since 2014, I am still amazed at how friendly Chinese people are. I know with my height, blue eyes and (sometimes) blonde hair, I must seem a bit spooky to those I pass in the street. But I deal with a lot of local Chinese in my working life and my leisure time as well, and I have never experienced such a patient, friendly people who smile not just with their mouths, but their entire faces! This is a no-brainer, the freshness, the flavours and the exciting variations from region to region. Even a basic working lunch at what we would call a “food court” in Australia is a culinary delight - “fast food” in China does not mean poor quality. Some of my Australian friends who have never been to China might think twice about considering “freedom” a characteristic of Chinese life, but they couldn’t be more mistaken. I can wear what I want, when I want, do my hair the way I want, and no one bats an eyelid. On the whole, Chinese people don’t judge you for what you wear or how you look…as long as you are wearing clothes, anything goes! You can wear a suit to work, or jeans, everyday, no one cares. 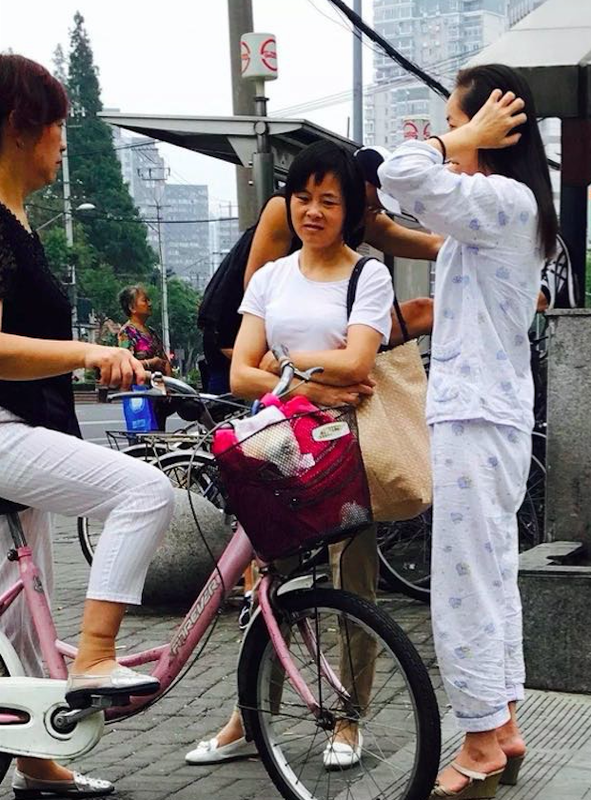 And I love that what Australia would consider pajamas for strictly indoors only, are worn regularly outdoors in China, often to dinner in the evenings or for a leisurely stroll along a busy street. How practical is that! Dinner, a stroll, and straight to bed without having to change a thread. Which brings me to my next favourite thing…. In Australia, “nanny state” laws that control so called “dangerous” behaviour seem to have proliferated each time I fly home to visit. Personal responsibility becomes less and less important. In China, I love the mentality that if it works for you, then do it. As a child in Australia I rode my bicycle without a helmet before the laws changed to demand you wear one. Now, in China, I can do it everyday just like I’m a kid again (at 48!). If you want to carry furniture on your scooter and you are clever enough to balance it, then do it! Fireworks anyone? Try to set off a box of fireworks in a park in Australia and you’ll be appearing before a court of law in no time. In China, go for it, it’s fun!!!! I think I’m old enough and wise enough to know when to cross the road safely, so I do it without the fear of a fine or scolding from law enforcement (although jay-walking is now curtailed and punished in some larger Chinese cities). Don’t get me wrong, Australia has good intentions when it comes to keeping its population safe, but it’s a refreshing change to feel like there is respect for your own ability to look after yourself. Personal responsibility, I love it! And here is the irony, despite Australia’s attempts to make things “safer”, I have never felt unsafe living in China. I’ve travelled a fair bit in my life, to most major cities in the world. And in those cities, including in my own country, I always feel like I have to be wary of the people around me, especially if I am out at night in unfamiliar territory. In China, I often walk the back streets of Shanghai, Beijing, Hangzhou or wherever I happened to be travelling for work or pleasure, and I never feel like my safety is under threat. I can explore without fear of being mugged, harassed or harmed in any way. It’s a wonderful, relaxing feeling to be able to discover new parts of a country, on my own, without fear. The tech revolution is nothing short of amazing over the past decade or so, but we in Australia are a poor cousin when it comes to technology that makes everyday living so much easier, and fun! Wi-Fi is everywhere in China and 99% of the time it’s free. Airports, train stations, subways, coffee shops, you get great Wi-Fi, for nothing! Combine that with WeChat, the most astonishing social media platform that does EVERYTHING, and you have life at your fingertips. My Australian friends sometimes excitedly tell me about the latest advances in social media platforms like Facebook in Australia, and here’s how I respond. Being an “entrepreneur” is all the rage in Australia as we strive to become the innovation nation. But to truly achieve that, Australia could learn a lot from China. A good idea in China will nearly always be actioned and not sit as merely a dream. In Australia we call ourselves the “have a go” nation, but the Chinese have taken this to the next level, with their positive attitude to life, their creativity, and their vibrant culture bursting with new desires and new aspirations. Aodaliya Exports helps businesses access the China market by being on the ground with our team in Shanghai. Find out your market potential in China for as little as $600 AUD by clicking here.